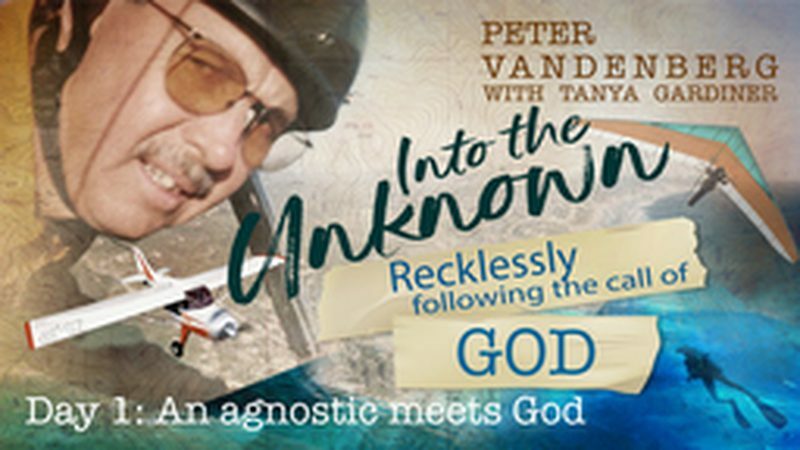 Into The Unknown - If you decide to “go after God” you may be led to fearlessly jump out of the plane of your current life and jump into a better one. God has created you for a special purpose and will make a way to reveal Himself to you for a great adventure. Gird your belt, and with Peter Vandenberg as your guide, get ready to take off for an amazing 10-Day Journey! Peter Vandenberg had rejected Christianity. Born into a faithful churchgoing family in 1947 Zimbabwe, he found the Christian message to be full of holes. While his parents were involved in nearly every facet of church ministry, Peter became an anti-evangelist with an axe to grind. As he entered early adulthood, Peter, wielding a neatly packaged agnosticism, was already taking the reins of the successful family business. Running Matthews Garage with his father, enjoying motor racing and plenty of friends to drink with on the weekends, Peter felt absolutely no need for God even if He were to exist. On his 21st birthday, Peter was surprised by a visit from a young South African woman he described as a "paragon of beauty and intellect." He quickly developed a relationship with Evangeline Raper, but she was deeply concerned about Peter's lack of faith and fervently prayed for his salvation. One day she asked him to visit a church near his home to support a couple of visiting ministry friends of hers – he did not hesitate to accommodate his new fiancé. Peter entered the church and listened obediently as Jannie Pretorius launched into his sermon. Mentally tearing philosophical holes in it while he listened, Peter was not surprised when the message took an evangelistic turn. But as the sermon concluded the preacher simply would not give up on his invitation. "I'm not going to close this altar call. You need to come forward..." Pastor Jannie's words persevered, "Receive Jesus as your Lord and Savior." Peter shuffled awkwardly in his seat; something inside of him said "Go on and do it!" Eventually he just couldn't stand it anymore; he jumped to his feet, went straight to the front, knelt at the altar, and burst into tears. Something fundamentally changed inside of him that night that his philosophy could not explain. An agnostic had met God. In his early years one of Peter's main objections to Christianity was "I can’t see God!” In 1 John 4:7-17 what does John provide as evidence even though, according to verse 12, "no one has ever seen God..."? Reflecting on your spiritual journey, are there ways in which you have "seen God" and His hand at work in your life? How are these sightings related to John's evidence in 1 John 4? How do they encourage you for the future? Read Proverbs 3:5-8. How do these verses align with Peter's story of salvation? in what ways might they speak to experiences in your own story? On his journey to salvation, Peter was "wise in his own eyes" (Proverbs. 3:7). Why do you think that this attitude is such a barrier to salvation for many people?